The best gift of all is the one you share with someone else. . . From the moment he strode through the iron gate and into the offices of Two Love Lane on a crisp December day, it was obvious that Deacon Banks was something different. He wasn’t a Charleston native, not with that adorable Yankee accent. And unlike the usual client at the elegant matchmaking agency, he had no interest in finding a woman to marry―just a few no-strings dates while he was in town. Macy Frost takes her professional services very seriously―how could she not, when she’s rumored to be a direct descendant of Cupid? Tech entrepreneur Deacon says he’s just trying to make his social-climbing aunt happy by being seen out and about with a few prominent beauties, but Macy insists she can make her client fall in love…for real. And Deacon can’t help but think she might be right. As charming as the palmetto trees and magnificent harbor may be, it’s the beautiful, breath-of-fresh-air Macy who’s become Deacon’s favorite part of the scenery. But can the hopelessly romantic Southern belle stop trying to fix him up and just let Cupid do his work on her own heart? Ms. Kramer makes it easy to laugh right into love with this mismatched duo. She's a matchmaker. He's a heartbreaker. Neither are that big on being risk takers, but love has a way of making it's presence known. 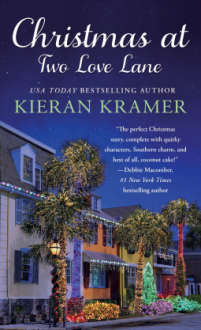 Christmas at Two Love Lane the gift that keeps on giving no matter the season.